Memorialize your loved ones with custom stained glass artwork from Stained Glass Inc.
Stained glass memorials are a unique and personal way to remember a loved one. If you are looking for a team of stained glass artisans to help fulfill your memorial stained glass needs, search no further than the team at Stained Glass Inc. Our craftsmen offer the best in beautiful image and text customization and our products are durable and created to last a lifetime. 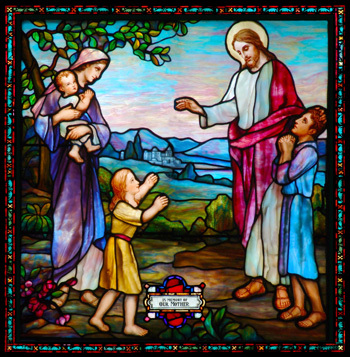 Many of our clients consider donating a memorial stained glass window to honor lost loved ones. 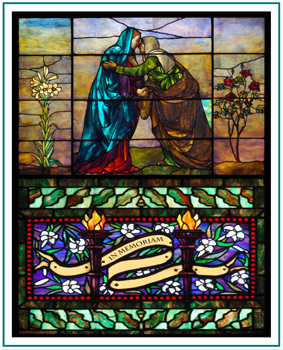 These windows may be incorporated into their own home decor or dedicated at their church or other place of worship. Other establishments commission Stained Glass Inc. to create beautiful stained glass windows in memory of loved ones for libraries, hospitals, and other special places. These heartfelt windows allow for your loved one to be remembered by people throughout the community in a beautiful and unique way. They also provide a special place for you to visit to remember them. Because we can custom make any type of stained glass design, you are free to incorporate any text and images that you wish including names, messages, or no text at all. The size, shape, and color of your finished design is completely customized to your exact specifications. Clients have also memorialized their loved ones through hanging stained glass memorials, or they choose to simply have a stained glass suncatcher created that can hang in front of existing windows. This is an ideal choice for clients who may be relocating in the future and wish to have a stained glass memorial that isn’t permanently attached to their building or house. While we take great pride in the beauty of our custom stained glass for memorials, it’s the quality of these stained glass dedications that have our clients choosing us above the competition. These aren’t ordinary dedications in stained glass. Custom stained glass dedications and hanging stained glass memorials from Stained Glass Inc. are strong and durable. At Stained Glass Inc., we use special materials that provide unsurpassed strength and durability as well as beauty and lasting color. Our stained glass memorials provide strength up to 250 times that of normal window glass. High impact resistance means that inserts will last a lifetime. Unlike other memorials in stained glass, our panels are made from polymer glass, the same that is used for airplane windows, to make them virtually unbreakable. Not only are the materials strong, but the color is fused directly to the glass with heat to guarantee long-lasting, vibrant color that is highly fade resistant. The team at Stained Glass Inc. will help make your design decisions as simple and seamless as possible. You can choose from thousands of designs, or you can work directly with our designers to put together stained glass dedications that are completely customized to your taste. Our friendly and knowledgeable design assistants are available to help you. Consultants can help answer any questions you might have about specific stained glass images or technical details. Our talented team of professionals will work with you using your measurements and color preferences to create the perfect stained glass memorials to honor your loved ones. If you have a special loved one that you would like to honor, call our team of talented designers today and get started creating their personal memorial. Personal way to remember a loved one. Customized to your specific size, color and shape specifications. Beautiful donation to a church or other special place. Stained Glass Inc. stained glass is strong and durable boasting up to 250 times the strength of ordinary stained glass. Shimmering mineral pigments fused to glass with heat ensure lasting color that won’t fade. Created by the talented stained glass artists at Stained Glass Inc.
Start on your Stained Glass Memorial Today! All of our memorials are custom made to your specifications for color, shape and size. Our stained glass design consultants will work with you to design the ideal stained glass memorial. Call us today!